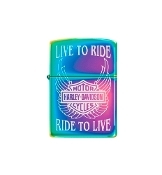 Harley Davidson Live To Ride Spectrum Rainbow Finish Zippo. Includes gift box. Guaranteed forever.